Displacement ventilation is an alternate air distribution method for commercial and industrial spaces. Used since the late 1970's in Northern Europe and more recently in U.S. schools, displacement ventilation disproves the common perception that improving indoor air quality in an air-conditioned space must result in higher energy consumption. By providing supply air directly to building occupants, air quality is improved. By conditioning only the lower occupied portion of the space, cooling energy can be reduced. A typical displacement ventilation system supplies conditioned cool air from an air handling unit through a low induction diffuser. The cool air spreads through the floor of the space and then rises as the air warms due to heat exchange with heat sources in the space (e.g., occupants, computers, lights). 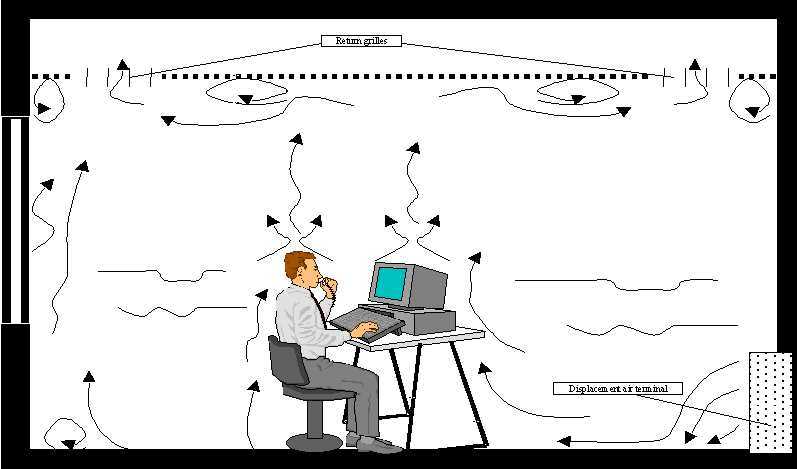 The warm air then exits the zone at the ceiling height of the room. Displacement ventilation can be coupled with other cooling and heating sources, such as radiant chilled ceilings or baseboard heating. Superior indoor air quality is achieved by exhausting contaminated air out of the room. Unlike mixing ventilation, displacement ventilation provides clean air to a room and removes contaminants created by heat sources in a room, resulting in an improved air quality. Dennis Sikkema is the Director of Technical Sales for Price Industries Inc. of Atlanta, Georgia. He has been with Price Industries for nearly 13 years. Previous to that he was with Tuttle & Bailey for 12 years as an Application Engineer, Product Manger, and a Regional Sales Manager. Also, he was an Application Engineer for Johnson Controls for six years. Dennis has a BSME from Western Michigan University. Dennis is a member of ASHRAE and has been involved in the development of ASHRAE test standard 130, the ARI 880 certification program and the ARI 885 sound program. Cost to students is $5 unless they are a member of ASHRAE!